Today on homify 360° we present to you a beautiful Victorian home in the highly desirable West London neighbourhood of Belgravia. 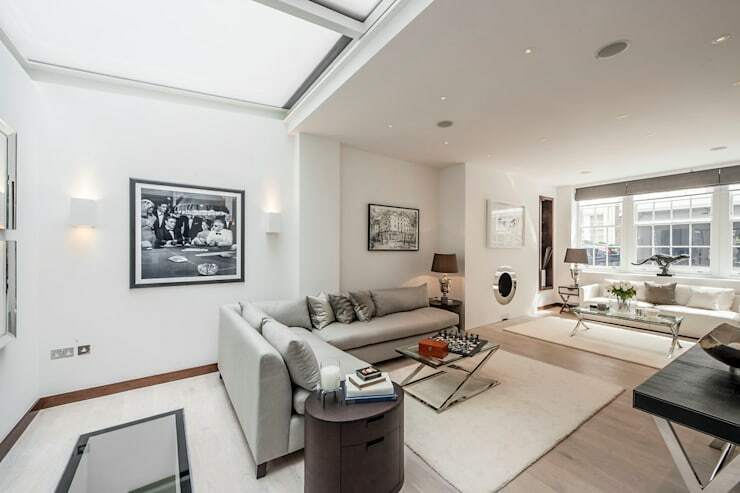 This stunning residence faces a small, quiet cobbled street and has been completely reconfigured to become a contemporary three bedroom home. It was designed by architectural design firm Landmass London, who have won a number of awards including Best London Property and Best UK Property. 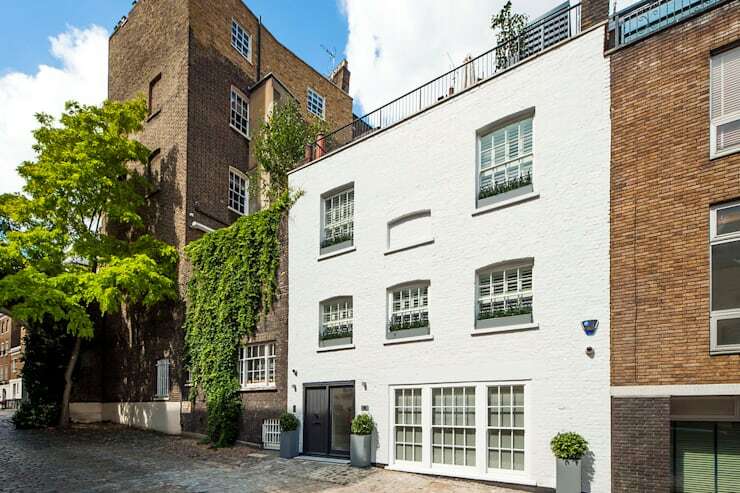 This mews-style residence was also short listed for the 2014 Best Residential Property. 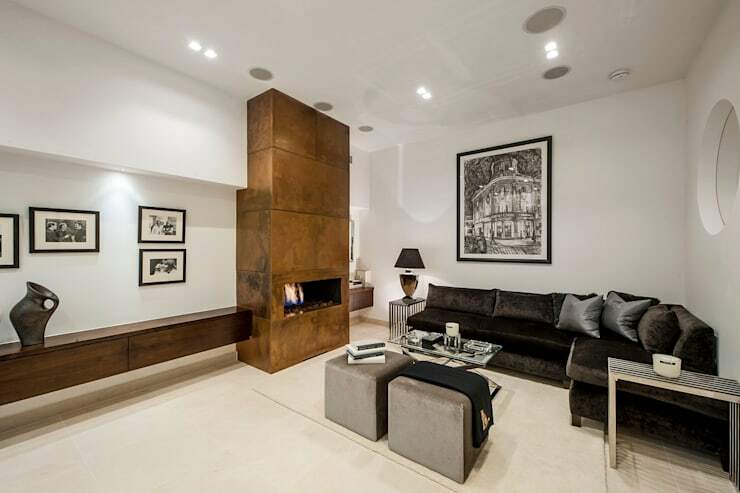 With that in mind, let us walk you through this dream home to give you a taste of how London's elite reside. As we approach the inner city mews-conversation home, you can immediately sense this is no ordinary dwelling. Straight away you can see it stands out from the other buildings in the street with its stark white paint from top to bottom. The bright white is in contrast to the exposed brick it is surrounded by and draws our eyes up away from the street towards to the rooftop terrace above, which we will show in further detail later. With some simple yet effective pot plants lining the front of the house, those approaching will be mesmerised once they enter the inconspicuous front door. As we step inside you can see immediately that every detail of every facet of this home has been carefully thought out. A monochromatic palette runs throughout the home, matching nicely with timber tones to break up the black, whites and greys. You can see a modern theme of cubes and clean straight lines is also present, with furnishings and decorations all exuding clean design style. 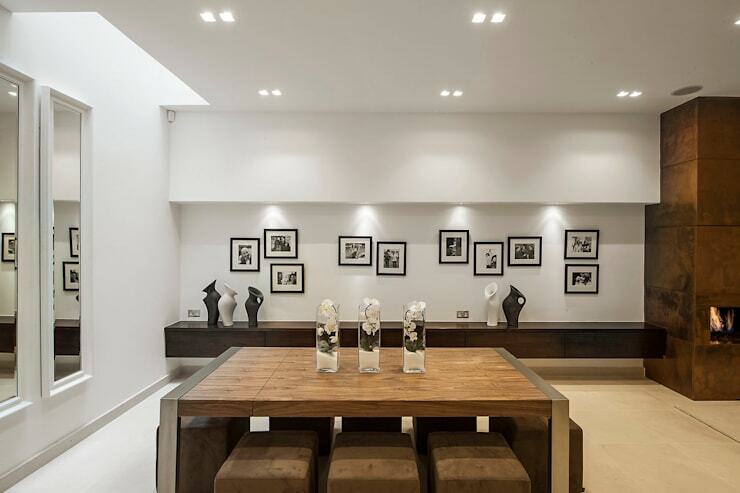 We love the square LED downlights, perfectly grouped in pairs, matching the bar stools and black and white photos hanging from the wall, which are also grouped in twos and threes. 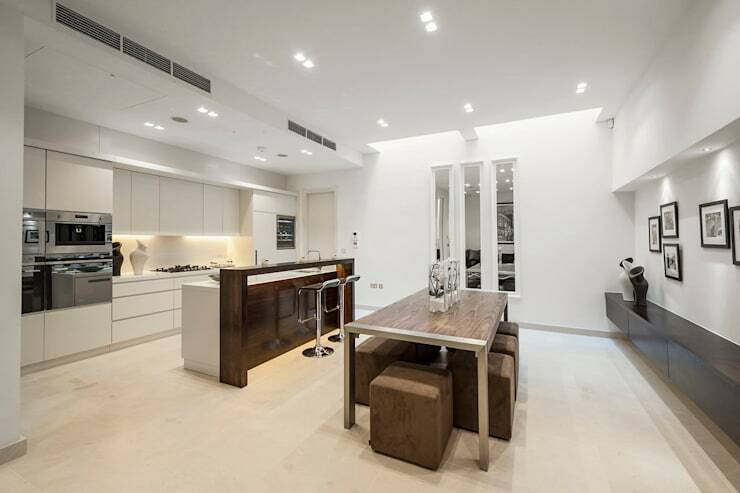 The feature of the open plan ground floor is the large timber dining table. This bespoke table is unique in design with a thick timber table top, with beautiful brushed chrome legs. The attractive lighting as well as the black and white photos also feature here, overshadowing the equally beautiful but more inconspicuous room-length floating timber sideboard. Moving around from the kitchen/dining half of downstairs we can see the lounge area, complete with fireplace for those cold English winters. The stools of this area match the stools used to seat those at the dining table. A large black and white photo hovers above the lounge, perfectly combining with the smaller frames to the side. Extracting maximum natural light was a big focus on the creative design and innovative space planning of this home. A retractable glass ceiling above part of the reception room with glass flooring allows light to flow directly into the lower ground floor, which commands a ceiling height of 3.2 metres. The reception room is another large lounge area perfect for escaping the many dinner parties that take place downstairs. 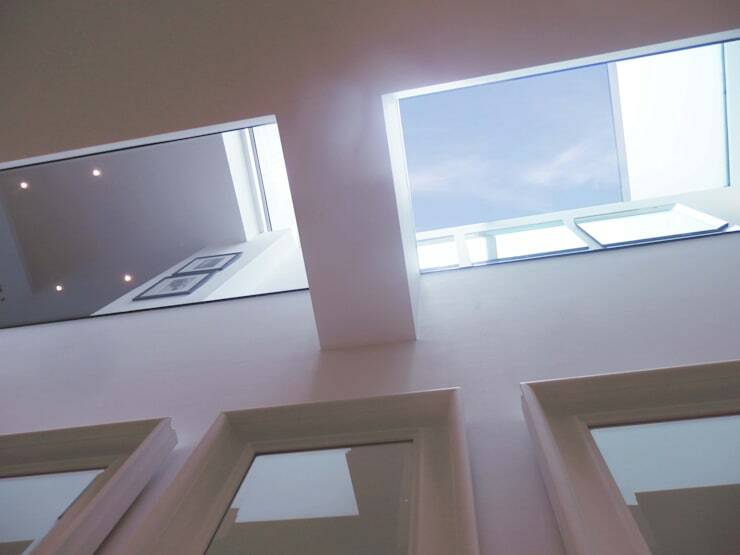 Here we can see in further detail the use of skylights to steal natural light from above, with the glass floor channeling the light into the levels below. Wow. A stunning master bedroom fit for a king, this sleeping space is likely to be an example of the perfect bedroom. Waking up in this bed, some might feel they are still in a dream. Again smart design comes into play, with the layout of this room carefully planned to maximise space without compromising on comfort. 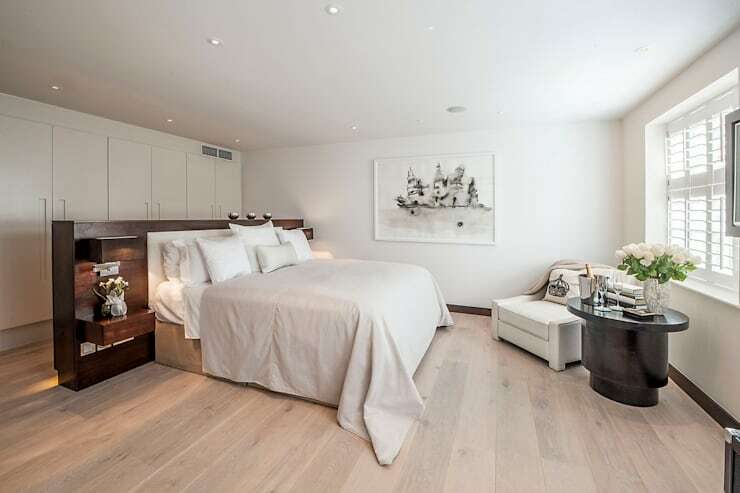 This unique and innovative design sees the bed itself placed on its own, pushed away from the walls to allow for cupboards to be installed behind. The elegant head board that overhangs either side of the bed mimics the feeling of the bed being pushed against one wall, although it sits central to the space. There would be no use in owning such an extravagant and desirable home, if you cannot share its beauty with those whose company you enjoy. What better way to spend your summers than feasting with friends and family in the sun on this stunning rooftop terrace. 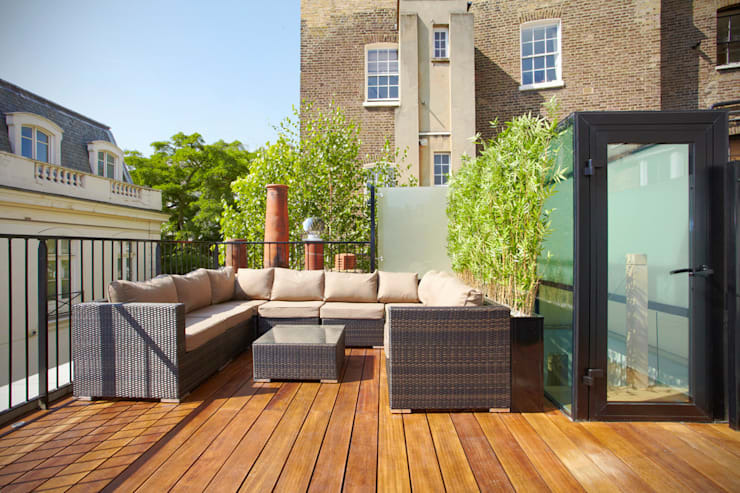 The large outdoor seating arrangement allows for several people to sit, drink, socialise, bathe in the weekend sun and enjoy the quaint views of residential West London. In keeping with the property's theme of sharp clean lines, the bathroom uses dark timber as the colour to pair with the stark white. The large mirror, which runs the length of the far wall, allows light to be magnified and the room to open up. Which is your favourite element of this beautiful English home? Let us know in the comments section.